The Ranchman’s Steakhouse, Ponder, Texas. | 50 Westerns From The 50s. « 50s Westerns Flea Market Finds. 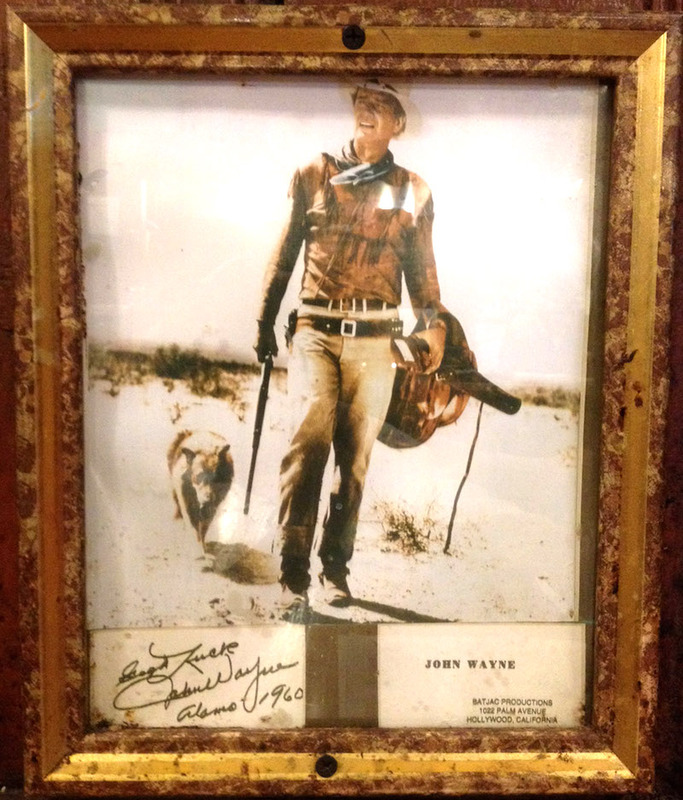 Toby, sounds like a good trip, while actually getting to sit in John Wayne’s preferred seat and eating a good steak is icing on the cake. Envious of you. THE CHARGE AT FEATHER RIVER has been announced for a release from Kino Lorber and 3 D film Archive on Kino’s Facebook page. Toby ,I have been watching THE ANDY GRIFFITHS SHOW lately (I have the complete series) and Raleigh has been mentioned at least twice so far. if this is an April Fool you certainly got me! John k ,sorry for the mix up.THE CHARGE AT FEATHER RIVER was mentioned in a 3 D announcement on Kino’s Facebook page for another 3 D announcement ,the 3 D nudie collection ,ADAM AND SIX EYES ,THE BELL BOY AND THE PLAY GIRLS and LOVE FOR SALE .Also announced is PARASITE .If I was going to play an April Fools joke I would have what I believe what is one of your most wanted releases on BLU RAY ,THE ALASKANS ,but then you’d probably never speak to me again.Somebody did request that just recently,but WB said legal issues prevent a release at this time. at any rate there does seem to be an interest in 3D Westerns. release of the CinemaScope Fox Western THE CANADIANS. of that happening,unless,of course Toby wins the lottery! If I win the lottery, it’ll be Hellfire and Hell Canyon Outlaws (and maybe Siegel’s Baby Face Nelson) — everything else will come later! Speaking of which, was looking at a LA Times from December 1957. Baby Face Nelson, Hell Canyon Outlaws and The Abominable Snowman Of The Himalayas opened there the same week (maybe the same day). John k ,another mix up .I knew the film you most wanted was set in Canada.I heard from Bob Furmanek and he said THE CHARGE AT FEATHER RIVER is owned by WB and he does not know if they plan to restore it.The good news is that are working on some vintage westerns on 3 D BLU RAY to hopefully be released next year.I joked to him not to leave it too long ,as it is my birthday today,and I want to be around to see them.I recently heard they are working on a 5 western boxset ,so Í don’t know if that’s true.The perfect April fool’s joke to play on me would be to say an A C Lyles western boxset was being released.I looked him up on the net yesterday ,and everyone says he made 13 westerns,but they never mention THE LAST DAY with Richard Widmark which was made for TV and is just as good as the others. Carey and Joanne Dru-I like all three of them in Westerns. made of it all,especially the Kennedy/McLaglen stuff. John k,my birthday is on 3 rd April ,the same day as Doris Day and Jan Berry of Jan & Dean .We are a day ahead ,so that my post on your computer must have said the 2 nd and your Birthday greeting to me says the 3 rd .I should receive my 2 orders from ESC soon,KIT CARSON and BADLANDS OF DAKOTA. Sorry,correction to the above…over 90 replies. I find it hard to knock Kennedy and McLaglen since I like many of their movies very much. Kennedy’s strength was certainly as a writer. He wrote some terrific stuff in the 50s and early 60s, and the two Support Your Local movies are fun. If both of them had come along earlier and worked in B films, things would’ve turned out better across the board. They made some pretty “big” pictures, which only highlighted their shortcomings. Shout has announced a blu-ray of THE GREAT NORTHFIELD MINNESOTA RAID. sadly the film is one of many Universal Westerns in dire need of some TLC. horrific they fall below what we now expect high def transfers to be. Another Universal Western that needs work is THE LAST SUNSET. at DVD Beaver has just reviewed Kino’s BEND OF THE RIVER. “Colour Bleeding” which are way beyond this Luddite! The trouble with the Band Of The River material is that the negatives have shrunk a bit, so it’s almost impossible to get the three colors to align perfectly. It looks great most of the time, but there are a few places where the registration is clearly off. Was really stoked to see the DVD Beaver review. Wanted this commentary to be a good one since the movie is such a favorite with so many people. After my Bonnie & Clyde trek around Texas (both the 1934 and 1967 varieties), I’ve been going back and watching the 50s gangster mini-cycle of Baby Face Nelson, Story Of Bonnie Parker and Machine Gun Kelly. I loved every one of them. They’ll turn up TH8 soon, I’m sure. Greg Walcott and Harry Carey Jr also along for the ride. Blu Ray 21 HOURS AT MUNICH a made for TV movie with a stellar cast. Roberta Haynes, has recently passed away RIP. John k ,I already have 21 HOURS AT MUNICH .I recently bought FORCE OF ARMS .Of the 76 films listed by IMDB I have about 46 including his first big break ,GOLDEN BOY with Barbara Stanwyck and his appearance in I LOVE LUCY. For his appearance in THE HORSE SOLDIERS he and John Wayne received $775.000 plus 20% of the overall profits ,an unheard sum for that time. John k,I mean’t to thank you for the William Holden news.Much appreciated.